Be the first to share your favorite memory, photo or story of Konstantin. This memorial page is dedicated for family, friends and future generations to celebrate the life of their loved one. 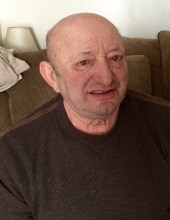 73, of Kenockee Township, passed away Sunday, April 14, 2019, surrounded by the love of his family. He was born in Ecka, Yugoslavia, April 29, 1945, the son of the late Jonel and Aurelija (Gilezan) Bucu. His marriage to Marika Bugar was July 21, 1972, in Yugoslavia. After 42 years together, Marika passed away on March 24, 2015. Tinu was of Eastern Orthodox faith. He grew up in Yugoslavia and was a barber for several years before moving to the United States in 1973 and becoming a butcher. He later purchased a farm where he raised pigs and grew produce for Detroit’s Eastern Market before opening Bucu Greenhouse, now known as D&B Flowers, Kenockee Township. Tinu was a jokester and had an original personality which always made others around him smile. Tinu enjoyed fishing, hunting, and loved spending time with his grandchildren and family. Surviving are his son and daughter-in-law, Daniel and Bonnie of Avoca, daughter and son-in-law, Lilyana “Lily” and Stephen Quandt of Lititz, PA; grandchildren, Drew, Dray and Dane Bucu and Michael and Megan Quandt, as well as many friends. The family honors the memory of Konstantin and invite you to visit and share memories Monday, April 22, 2019. from 3:00 to 8:00 p.m. at Kaatz Funeral Directors, Yale. Funeral services will be 10:00 a.m. Tuesday with 9:00 a.m. visiting. The very Rev. Fr. Gheorghe Carstea, pastor St. Nicholas Romanian Orthodox Church, Troy, will officiate. Burial will be in Elmwood Cemetery, Yale. To send flowers or a remembrance gift to the family of Konstantin "Tinu" Bucu, please visit our Tribute Store. Guaranteed delivery before Konstantin's visitation begins. Guaranteed delivery before Konstantin's service begins. "Email Address" would like to share the life celebration of Konstantin "Tinu" Bucu. Click on the "link" to go to share a favorite memory or leave a condolence message for the family.